"Accidents interest me, I have a very queer mind you know. Laurence Stephen Lowry (1887-1976) used to say that he simply painted what he saw, common everyday scenes, often of incidents that caught his attention. provided him with a unique opportunity to wander through the streets and enter the homes of 'his people'. Here he talked to and grew to understand and appreciate them. and reproduced in his art. 'When he saw a sight that attracted him he would stop in his tracks and... sketch on any piece of paper that came to hand'. Lowry lived and worked all his life in Manchester and neighbouring Salford, one of the largest industrial communities in the north of England. The industrial revolution in the 19th century brought about a huge population exodus from the countryside into the cities by people seeking work. The massive influx of people forced the labouring classes to live in slums; only the middle class could afford to live out of the city centre and commute. Overcrowding was a key factor in the spread of diseases such as diphtheria and scarlet fever. The small houses could contain up to ten people, living in unventilated rooms. Between the rows of terraced housing there were open drains and rubbish where children played, and water came from wells that were often polluted. The poor living conditions, long working hours in the mills and low pay all contributed to the general ill-health of the population and the frequent spread of disease. Lowry met such sights every day and they were reflected in his paintings. to the local isolation or infectious diseases hospital. These vehicles were in existence throughout the country from around 1910 to the 1950s and had various nicknames. "The Fever Cart was a frequent visitor to Rainham in the early part of the century and although we children held our noses as it went by; many of us became passengers in our turn.... I remember being bundled up in a red blanket and lain head to the front in the little cab. I was probably too ill to notice much of the journey... but I do remember the bumps of what I thought was the horse kicking the cab by my head". often continue to play with friends in the street and to mix with neighbours, allowing the disease to spread. Diphtheria was likewise highly contagious, generally affecting the throat but occasionally other mucous membranes and the skin. an outbreak on a farm could lead to a ban on the sale of dairy products and hence loss of income. The principal treatment was isolation. Patients were taken from their homes and isolated in special fever hospitals for up to six weeks. This allowed time for their own immune system to fight off the infection and limited the risk of contamination between patients and family. and my mother was allowed to stand on a chair outside the window and see me in bed on Sunday and Wednesday afternoons". The fever van symbolized the power of the medical officer of health, and was disliked and feared. such was the high mortality of scarlet fever and diphtheria. Moreover, there were more materialistic concerns. its bedroom disinfected by the application of concentrated solutions of powerful germicides to the floor, bed, walls and furniture. Wallpaper must also be stripped and burned". These procedures caused much disruption and discomfort for the household. the local infectious diseases hospital in Salford at the time. Subsequently all the ambulances in the area were brought together under a General Ambulance Service. The ambulances based at Ladywell remained there, where disinfection facilities were available, until 1950.
taken away. They even have their back to a surgery that is clearly marked in the foreground; a building associated with illness. There are church towers and mill chimneys in the background of both pictures, but much more prominent in The Fever Van. The presence of the mill chimney perhaps offers a subtle indication of the root cause of the illness; the overcrowded living conditions of the mill workers. The church suggests the unpredictable outcome of the child's illness: will it be the site of a thanksgiving or a funeral? A noteworthy feature of both pictures is that the church clock has no hands; perhaps suggesting that life is so monotonous that time ceases to be important. When Lowry painted The Fever Van his mother, a strong influence on his life, had been an invalid for some years. just before his mother's death, suggests that this was so. 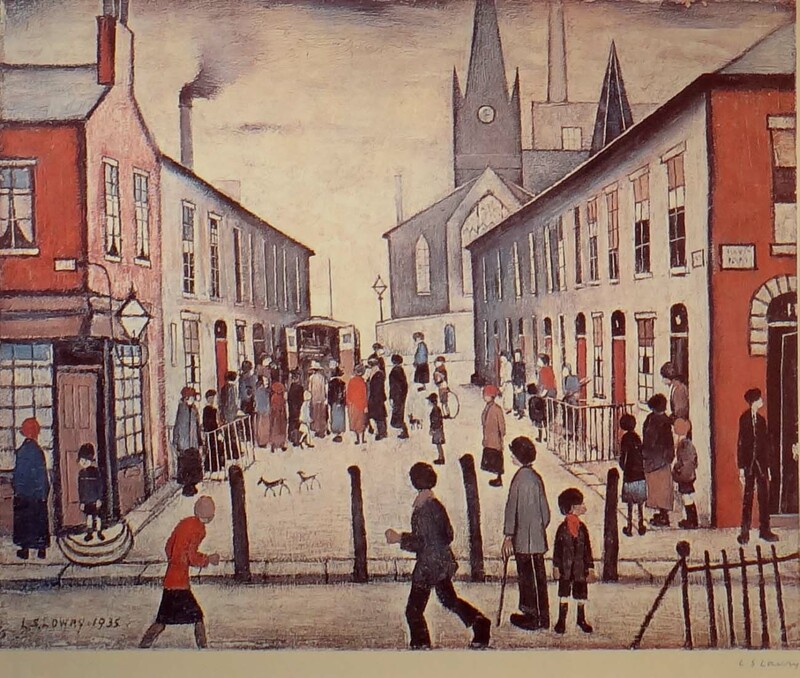 The life and times of Artist L.S.Lowry. Laurence Stephen Lowry did not like to think of himself as an amateur artist. People would occassionally accuse him of being self-taught and untutored. he commented, "Started at fifteen years old. Don't know why?" My aunt said "You are no good for anything else, so you might as well go to Art School." LSLowry began evening classes in antique art and free handart drawing during 1905. Later studying in both the Manchester Academy of Fine Art and The Salford Royal Technical College at Peel Park. School records show that Lowry attended art classes during the 1920's. Lowry had learnt from teachers, people such as the Frenchman Adolphe Valette. This French Impressionist artist had made a big impact on the art world. He saw from exhibitions in Manchester how the current trends in modern art were changing, and had great affection for Pre-Raphaelite art, by artists such as Rossetti and Ford Madox Brown. 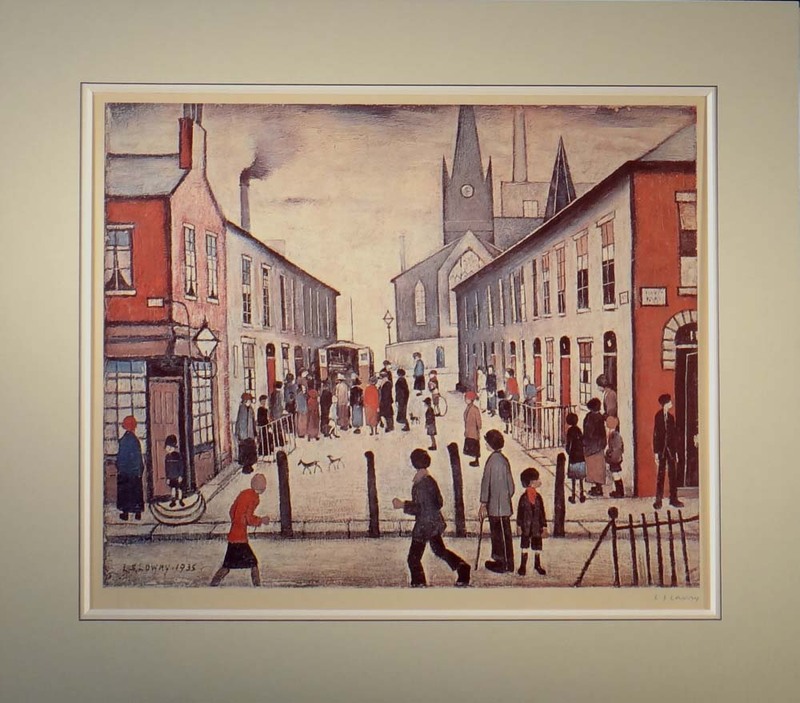 A naive Sunday artist LS Lowry certainly was not. Lowry strove for a distinctive way of painting and drawing, and for a subject matter Lowry could make unique. Lowry eventually chose the view from the Technical College window. Industrial scenes of Salford and Manchester, rather than that of a model posing. These were years of isolation and growing despair, reflected in the paintings of Lowry. They depict derelict buildings and wastelands as mirrors of himself. As an official war artist - himself emotionally blitzed - Lowry drew the ruined shells of bombed-out buildings. In 1939, the year Mrs Lowry died - the person he most wanted to please - success came with the first London exhibition. "When the mother of Lowry died, all interest was lost, continuing to paint was the greatest salvation". Just when this northern artist began to have success, Lowry was moving away from the subjects that everybody wanted him to produce. "If it were not for lonleness, none of my works would have happened". Some of the most powerful paintings by Lowry are deserted landscapes and seascapes. Some of the most difficult pictures to enjoy are of solitary figures and downs and outs. "These people affect me in a way that the industrial scene never did. They are real people, sad people. Sadness attracts me, and there are some very sad things. similar feelings in myself". Everything came too late for Lowry, but the later years saw the British artist become a popular celebrity. Lowry also became preoccupied about whether his art would last. "Will I live", he asked over and over again, like the art of the Pre-Raphaelites Lowry collected and loved, "I painted from childhood to childhood". Lowry became an old man - often protesting to interviewers that he had "given up, packed it in".